Amazon.com founder Jeff Bezos has clearly felt inspired by the power, enormity, and vitality of the Amazon rainforest and river. After all, he named his company after them, and he has now created an urban rainforest inside the company’s Seattle headquarters. Unfortunately, paying homage to a place doesn’t protect it. While Amazon.com’s stock soars, the real Amazon faces an alarming rate of deforestation, driven in large part by agribusiness, industrial development, and natural resource extraction. A world in which the e-commerce giant is the only Amazon that remains would be unlivable for us all. 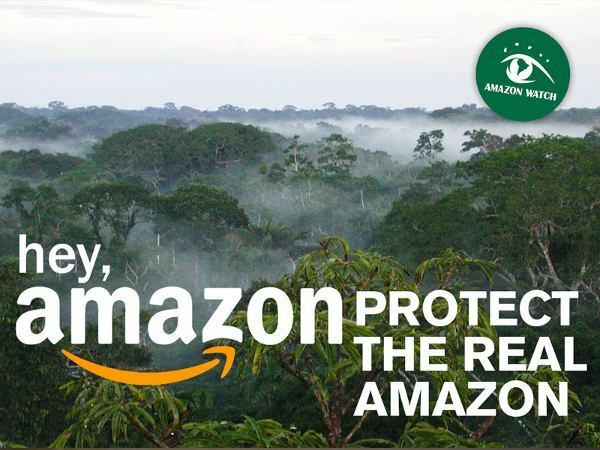 That’s why we’ve launched an action calling on Amazon.com to lend its innovative and expansive spirit to Amazon rainforest protection and environmental sustainability. One of the biggest threats faced by these real Amazonians and their rainforest home, particularly in remote areas of the western Amazon, is oil drilling. Oil drilling in the heart of the Amazon drives deforestation, violates the rights of indigenous peoples, and exacerbates the global climate crisis. Real Amazonians – indigenous peoples who have called the region home for millenia – are risking their lives to protect their ancestral territories and this globally important ecosystem for our collective benefit. On the other hand, Amazon.com and its staff – whom Bezos calls “Amazonians”! – are benefiting from the brand of the rainforest while doing little to protect it. It is not only Amazon.com’s name that ties it to the Amazon rainforest’s survival. Research by Amazon Watch tracked crude oil drilled in the Amazon all the way to the United States and found that about 60 percent of crude oil exported from the Amazon comes to the United States. Much of that Amazon-derived fuel is then consumed by companies with large transport footprints, including Amazon.com. Our repeated attempts to reach Amazon.com sustainability representatives on the company’s use of Amazon crude have been met with silence, except for one generic email reply. Amazon.com is a laggard with regards to sustainability in other ways as well: it has not published a sustainability report, disclosed its carbon footprint, or developed a transparent and comprehensive plan to decrease the greenhouse gas emissions from its supply chain. Amazon.com is one of the world’s largest retailers, shipping millions of packages around the world every day, and it prides itself on innovation – including the expansion of its own vehicle fleet. So why hasn’t it been a pioneer in greening its transport operations? Why has it remained silent on the protection of the biome that serves as its namesake? It’s disappointing, to say the least. The good news is that Amazon.com can still turn it around. The Amazon rainforest and its Amazonian guardians remain standing, despite myriad threats. Amazon.com still has the opportunity to establish an environmentally-conscious legacy and show that the Amazon rainforest – and by extension indigenous peoples and the global climate – is at least as important to Mr. Bezos and his company as an urban rainforest designed to attract employees. The time for climate leadership is now. If Amazon.com wants to pay real homage to the original Amazon, it should join in protecting the region that gives the company its name – not contribute to its ongoing destruction. This effort represents one piece our End Amazon Crude campaign, which forms part of Amazon Watch’s broader organizing to stop Amazon destruction. 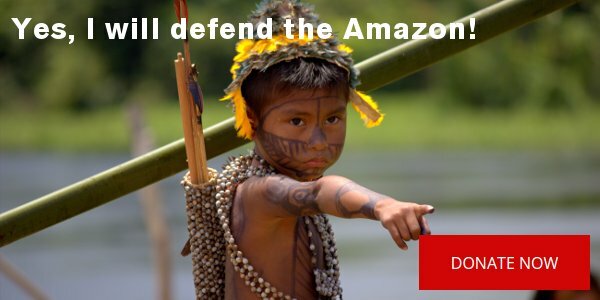 Yes, I will defend the Amazon!